Our daughter of Rotspon Cayuse Monikas Majik did well at her first big outing away from home at the NSW State Championships.She was champion Suitability For Dressage from one of the largest classes and reserve Champion in both th ePreliminary and Novice Dressage tests,plus placings in led and ridden hack and hunter in hand.She has been bre d to Cayuse A Grand Illusion by embryo transfer so she can keep competing under saddle. 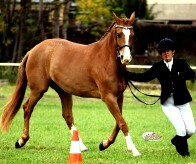 She also was reserve National champion Novice Dressage horse at Tamworth National 2011. 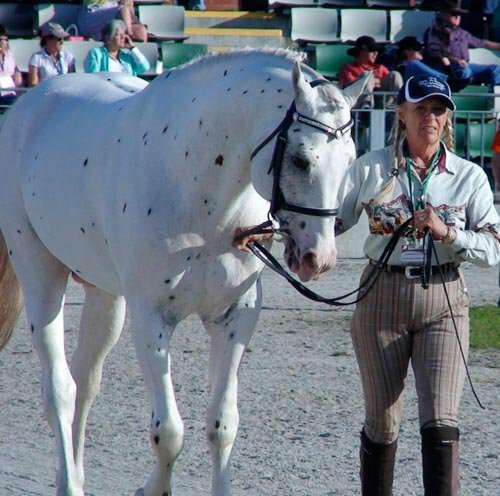 Vince skillfully rode the lovely mare Cayuse Likeable Lena owned by Warren and Ann Lewis Woodend Victoria to win the Open Reining at the 2011 Appaloosa National Show,Tamworth.See her video on the video link page.Vince had in times past trained her dam Cayus eMighty Irresistible by Mighty Storm Song(USA)to wins in reining (plus other events)at National and state shows. 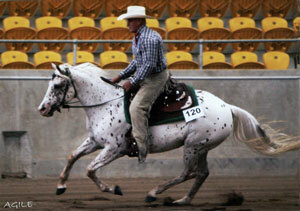 Cayuse Chatta Lena also went reserve National champion in the National Open Reining also ridden by Vince. MAKING THE MOVE TO A SPORTALOOSA..
Well the following two new owners are now happily riding after having temperament problems with their previous breeds and now finding out the joys of riding a Sportaloosa!Louise Anderson is braving the cold winter here getting the lovely Cayuse A Grand Illusion gelding A Perfect Illusion ( stable name Leo) ready for some serious dressage when the spring comes.He is also enjoying his jumping lessons,after all he is related to some talented horses. 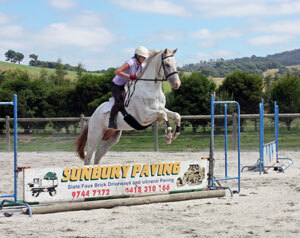 Jo Donaldson of Gunnedah NSW is having a ball with her new gelding Avenlee Starbuck. 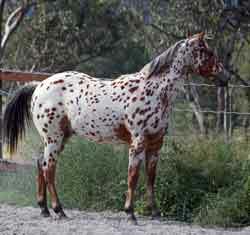 (EFA name Cadbury.all thos echocolate spots!! 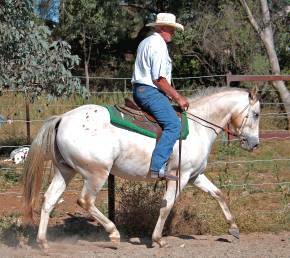 )This great moving horse was bred by Heather Lee of Helidon Qld.Heather also usually has nice youngsters for sale.Jo is a dedicated dressage fan and arranges some great dressage clinics in the area with talented trainer Carlos De Cleermaeker. 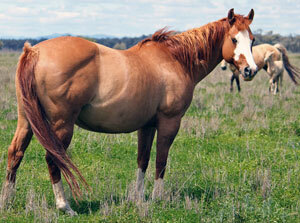 STATE CHAMPION HALTER/PERFORMANCE MARE TO NZ. 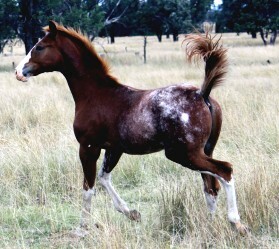 The beautiful red dun blanket daughter of Mighty Storm Song(usa) is now safely at her new home at leading breeder Sparkling Acres Sportaloosa/Appaloosa Stud,Wellsford New Zealand.This talented mare is due to foal beginning September to the multi state champion Cayuse A Grand Illusion.So we wait anxiously to hear the outcome of a future champion.WOW the foal was a red dun fewspot filly.how good can you get...well done Curly.....Check out her foal on the 2010 foal page..
Caroline Kitchener,Tasmania,fell in love with the huge foal Cayuse Walkin N'Talkin on a visit to Club Cayuse earlier in the year.This big,flashy moving boy is headed towards a great riding /showing career and he started off well winning reserve champion in the first Sportaloosa Video Foal Futurity against 17 foals from Oz and New Zealand. 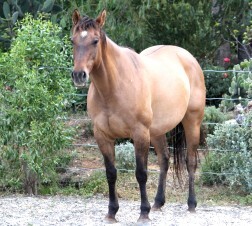 One of the last sons of the cutting legend Ric-O-Lena ,Cayuse Let's Tos has headed south to Frankston Victoria.This unusual buckskin roan gelding is going to be the trial riding and show mount for Yvonne Millett.We hope you have many hours of wonderful riding together.Enjoy. Rebecca Morsink,Bundendore,NSW has fallen in love with her new filly Cayuse Perfectly Grand,(obi).This lovely red dun blanket girl is another super moving daughter of Cayuse A Grand Illusion(he certainly is putting the movement into his babies).She is excited about training this young filly and eventually tackle some eventing courses on her,best of luck and keep us posted. The handsome Royal Hit gelding,Cayuse Mighty Hit has been added to the Symonds family show jumping team.This keen family from Kidmans Camp Bourke are a very talented team of extra keen show jumpers so Mighty Hit has landed in some very good hands!Young Kayla has also put her claim on the big foal Cayuse Warrigal for another future star. NOW YOU'RE TALKING SERIOUS SPOTS!! 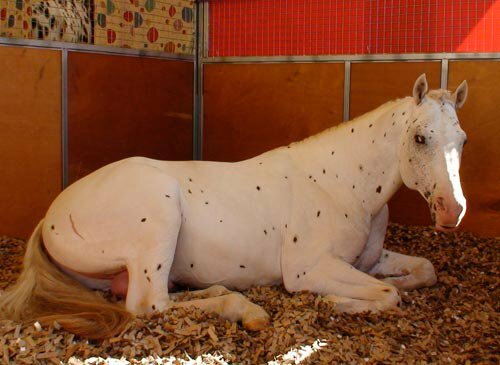 There Are Great People In the Horse World!! 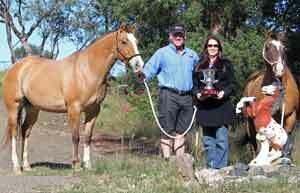 We want to thank Aaron and Mel McDonald,Young NSW for their great gift of the most super perpetual trophy for the Sportaloosa International Video Foal Futurity.They are also excited that their brilliant old broodmare Cayuse Mighty McJames is the first mare in foal to Lor's Flashpoint Af Lyn!Plus they took home my favourite Cayuse Sign Of A Storm in foal to Cayuse A Grand Illusion.Boy they might even win the trophy back next year! 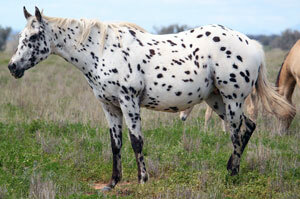 PUTTING THE SPOTS BACK INTO TEAM PENNING/CUTTING! Congratulations to Jenny McNabb,sunshine coast Qld . 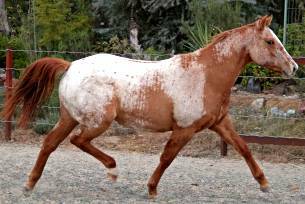 for selecting the super athletic leopard gelding Speakin Spanish.The first foal by Cayuse Chatta Lena and I think she'll find he has all the right moves to put any cow in it's place!He can jump too!! 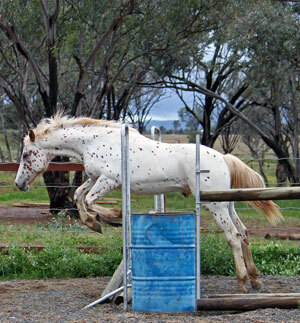 !Club Cayuse horses are bred to be multi talented....and they are!! Sign is settling in well with her new family Aaron and Mell McDonald Young NSW.As well as being in foal to Cayuse A Grand Illusion she is proving to be a great riding horse for all the family. 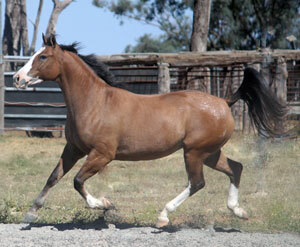 Congratulations to Kerry and Ron Hartmann of Nnamtrah Sportaloosa stud,Tamworth on buying this lovely herd improver.One of the last daughters of Mighty Storm Song(USA) and full sister to the multi champion Cayuse Jackson.She just foaled a sensational colt by Cayuse A Grand Illusion(see him on the foal page). 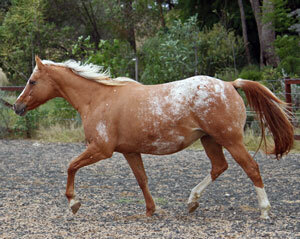 A FUN HORSE FULL OF CHARACTER! Cayuse Major Few has found a wonderful home in Victoria.This cheeky character will team up with Debra Meilak and I know they'll have some wonderful times together in the show ring and on the trail.Enjoy your spectacular new friend! 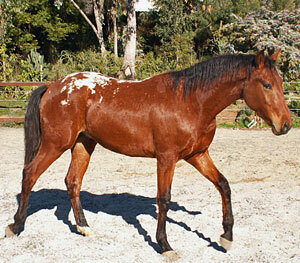 Cayuse A Star For Storm arrived safely in her new home.Joanne Pedley is hoping for a great Sportaloosa foal next year by Cayuse A Grand Illusion that one day will become another versitile eventer. 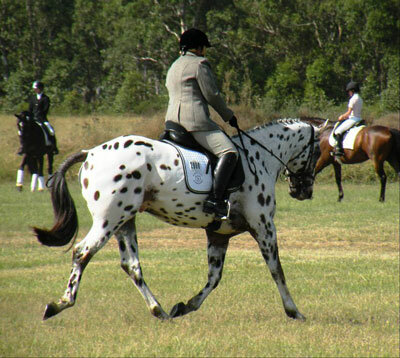 We had a great trip to Equitana ,Melbourne.Thanks to Ann and Warren Lewis of Lewiville Appaloosas for putting us up for the week.Had a very busy time manning the Sportaloosa International Stand in Breeders Village.Talked to hundreds of people and lots were very excited about the promoting of the spotted sporthorse in open company.Cayuse A Grand Illusion made lots of new friends and also had a busy time between sleeps in the stallion parades and breed demos ,also gota an interview on HorseTalk TV and the newspapers. !He was glad to get home to his girls! !Worried that 'Alf' might have stolen them in his absence!! Do I have To get up again! !